Returns whether this TorrentFile is equal to the given object. 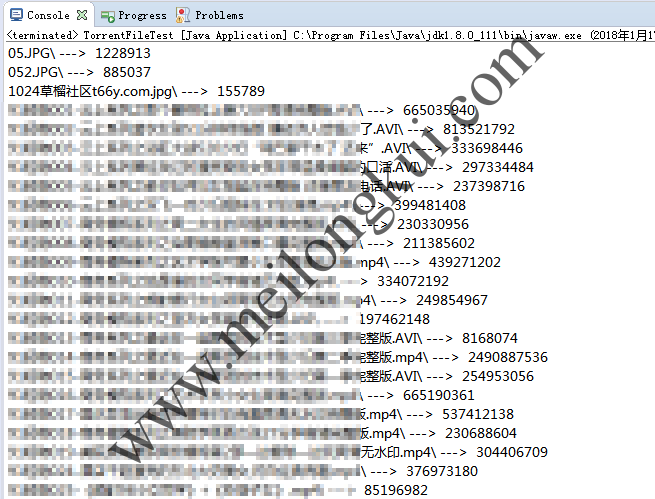 Retrieves the names of all of the files’ that is specified by this Torrent. Returns the hexadecimal representation of the hash returned from getInfoHash(). Returns the hash of the info dictionary specified by the torrent’s metainfo. Retrieve the specified lengths of the files contained within this torrent. Retrieves the name of this torrent file. Returns the number of pieces associated with this torrent. Returns the length of a piece. Returns a string array that contains the SHA-1 hash of each of the pieces defined by the torrent’s metainfo. Gets the file that has been set as the target file of this torrent per setTargetFile(File). Retrieves the total length of all of the files specified within this torrent. Retrieves the URL of the tracker that’s handling the requests for this torrent. Returns the hash code of this TorrentFile based on its info hash. Returns whether this torrent is associated with multiple files or not. Writes the contents of the file that was used to initialize this TorrentFile onto the provided file. Sets the target file or folder that this torrent should download to or look for the corresponding files in. Checks the integrity of the target file or folder as set by setTargetFile(File) to determine whether its contents pass all of the hash checks.